TechServe Alliance is the premier IT & engineering staffing association dedicated to advancing excellence and ethics within the staffing and solutions industry. The group is made up of the leaders in our space and together, we serve as the voice of the IT staffing industry. Hundreds of IT & engineering staffing and solutions firms and tens of thousands of affiliated professionals count on TechServe Alliance to keep their leadership informed, engaged, and connected. I went to TechServe’s annual conference last week and I'm writing to report what is new and disruptive in our industry, what my peers consider top-of-mind, and relevant takeaways that our partners in the broader IT space can take back to their organizations. What is top-of-mind for IT Staffing Professionals as we look towards 2019? Shortage of IT Talent – According to the U.S. Department of Labor, the unemployment rate for the month of October, 2018 is 3.7%. Information Technology unemployment is 2.6%. One of the benefits of participating in TechServe is access to the knowledge and best practices of an entire industry and tapping the collective scale of hundreds of companies. 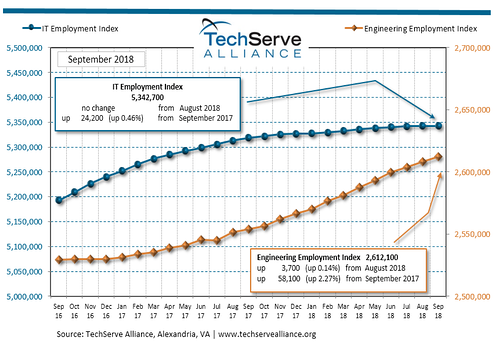 Every month, TechServe releases detailed analysis of IT and engineering employment trends to inform our staffing industry and the IT world more generally. Exhibit 1 paints the employment picture we currently find ourselves in. One could glance at this Exhibit and conclude that IT employment is hitting a ceiling of some sorts; that IT employment is finally slowing down. However, you would be mistaken and unaware of a challenge that we as staffing professionals must come to terms with and help inform the IT community about. The reality is that the lack of IT talent is creating a slowdown in job growth and, therefore, a slowdown in progress and innovation. There is no lack of jobs for IT professionals, but rather a lack of applicable IT talent to support organizational growth. This problem is being further exacerbated by changes in H-1B legislation and the lack of development of local IT talent in substantial ways. In particular, Cyber/data security, Cloud architecture, Big Data, DevOps, and Web Development functions are proving especially difficult to hire for. Access to H-1B Talent - On April 18, 2017, President Trump signed the Buy American and Hire American Executive Order, which seeks to create higher wages and employment rates for U.S. workers and to protect their economic interests by rigorously enforcing and administering our immigration laws. It also directs DHS, in coordination with other agencies, to advance policies to help ensure H-1B visas are awarded to the most-skilled or highest-paid beneficiaries. This legislation inordinately affects the IT industry given its highly diverse, international talent pool with a larger percentage of H-1B talent. There have been a host of policy changes enacted by the Trump administration that the IT industry has had to bear, but there have also been increased investigations into H-1B holders, increased denials of applications, all contributing to heightened uncertainty. 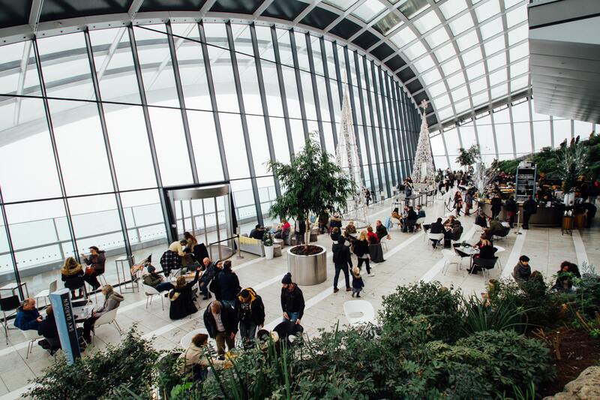 (Exhibit 3) Many organizations are shying away from engaging contractors or bringing on full-time employees that require visa sponsorship to mitigate risk and potential costs amid this uncertainty. Overall, restrictions to H-1B talent and uncertainty around this category of technologists are contributing to the IT talent supply problem. Managed Service Providers are not delivering the type of timely, quality IT Talent Organizations are expecting: If you are not working at an organization that employs an MSP to accomplish hiring goals and reduce costs, you are at least familiar with the term given the growth and prevalence of the outsourced function as it relates to staffing. At a high-level, companies that have hiring managers work directly with staffing partners experience about a 30% success rate from presentation of the candidate to close. If your organization employs an MSP that allows for manager contact, you experience a 10% success rate and with no manager contact, a 4% success rate. Ultimately, MSPs are not providing the transparency, analytics, and partnership required for a successful hiring process. There has been a race to the bottom among MSP providers, a space that has become highly saturated and commoditized. Since the inception of MSPs over 20 years ago, “the juice has been squeezed,” according to Shashank Saxena, the CEO of VNDLY, a company disrupting the MSP space with a next-generation vendor management platform. More and more, organizations are looking to SOW work based on specific deliverables to accomplish project-based goals. This commentary is part of a much broader conversation about MSPs, their benefits and disadvantages, how and when to successfully use, etc. I believe we are in a new era of hiring where high-touch is needed to enable high tech value creation as compared to bottom-line cost savings. Visit us to learn more about Advanced Resources' IT staffing services. Looking for your next career move in IT? View our jobs here. About the Author: Jack Sheridan is a Technical Advisor with Advanced Resources' Technology division. Jack is based in our New York office.